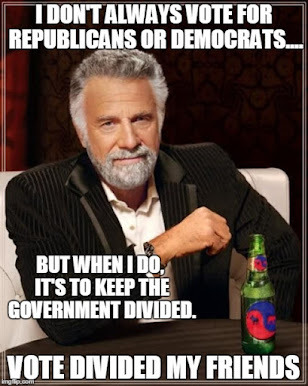 The Dividist Papers: Keepin' it real with divided government. Keepin' it real with divided government. Yeah, I've been a bit inattentive to politics and neglectful of the ol' blog over the last few weeks. This seems to happen whenever I find myself in close proximity of water and fishing gear. Time for my semi-annual resolution to pick up the pace and promise briefer, more succinct, on-topic posts on a more predictable and timely basis. Really. I mean it this time. 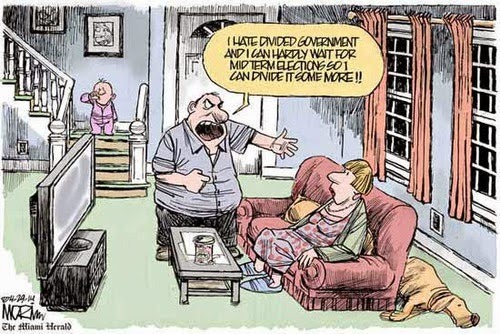 Get real about divided government. We know that we will be forced to raise the debt ceiling, but we also know that we cannot continue to spend money we simply do not have. The debt ceiling vote should give serious people on both sides of the ideological divide an opportunity to show that they understand the urgency of this problem. We can and should pass a debt ceiling increase that begins to cut spending, rather than simply writing more blank checks for Washington. Additionally, the Simpson-Bowles commission provides an important bipartisan framework for tacking the growing problem of deficit spending. While not a panacea, the Simpson-Bowles commission does represent an important first step." According to CNN, Tom is the "CEO of the Republican Main Street Partnership, a nonprofit organization of centrists in the GOP". Yeah, I had no idea such an organization existed either. I suspect that a meeting of "centrists in the GOP" is every bit as lonely as a meeting of "centrists in the Democratic Party". I just suspect there is not much of a there there. No matter. The point is that centrist policies do not emerge from single party control of the government, regardless of whether the Republicans or Democrats are in charge. We get centrist policies when we have divided government. Not because divided government ushers in an era of political civility and and bipartisan cooperation. Quite the contrary. We get centrist policies in a divided government because nothing else can get over the partisan divide. If legislation is not sufficiently centrist to draw bipartisan support, nothing passes. Full stop. I'm good with that. No legislation is better than bad legislation [See single party legislative abominations Porkulus and Obamacare - both passed on pure partisan votes]. This does not mean that centrist legislation passed in a divided government is always good legislation. Far from it. But you can rely on single party partisan legislation to almost always be bad. And when something does need to pass - like raising the debt ceiling - it will. But only after the usual Kabuki theater and partisan brinksmanship. As it must be to ensure both sides of the non-centrist aisle are equally unhappy. Oh, you do get some centrist legislation out of single-party rule. But you also get ALL the dog-whistle BS (usually social-agenda issues) from that party's wingers passed. That's the stuff that hurts, pretty much regardless of party. Over time, those social-agenda items that actually reflect majority sentiment tend to become centrist issues.